Now in his 18th season, Grizz, the mascot of the Memphis Grizzlies, has remained a furry fan favorite among members of Grizz Nation, so much so that he was named 2011 NBA Mascot of the Year as voted by his peers. Born in Vancouver, Canada in 1995 Grizz can always be relied upon to electrify audiences with dramatic duncks and signature shenanigans. 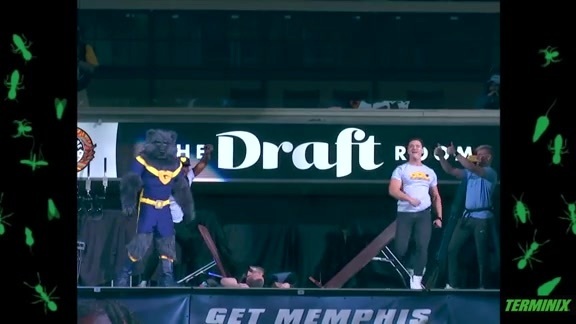 In celebration of the Grizzlies' historic 10th Season in Memphis, Grizz re-introduced his equally popular alter-ego, Super Grizz, as a nod to the organizations first seasons in the Bluff City. Donning a mask and cape, Super Grizz encouraged fans to Believe as the team earned it's first postseason berth since 2006 and advanced to the Western Conference Semifinals in thrilling fashion. Memphis has proven to be the perfect natural habitat for Grizz, who often stars in schools throughout the Mid-South as part of a variety of community initiatives. When not rallying fans at FedExForum or making appearances around town, Grizz is often found at St. Jude encouraging children in their battle against cancer, an issue near and dear to Grizz's heart after his own defeat of the disease in 2008. To show support for Grizz and other patients in the fight against cancer, you too can be a 'Friends of Grizz and St. Jude by donating to St. Jude Children's Research Hospital. Book Grizz for your birthday party or other special event. Got a question, comment, or great idea for a stunt? E-mail the big guy (but not during feeding time, please). Like the Grizzlies on Facebook. Kids, be sure to ask your parents first. Super Grizz takes out the trash. 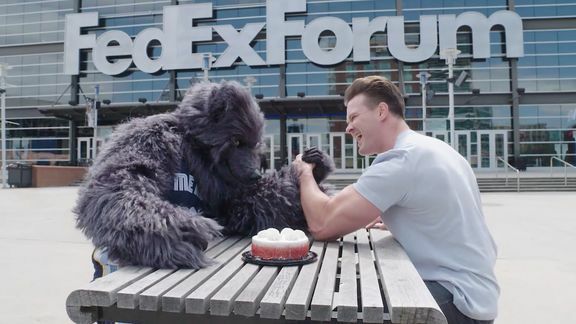 Take a look as Grizz challenges all NBA mascots to participate in the Make-a-Wish Arm Wrestling Challenge. 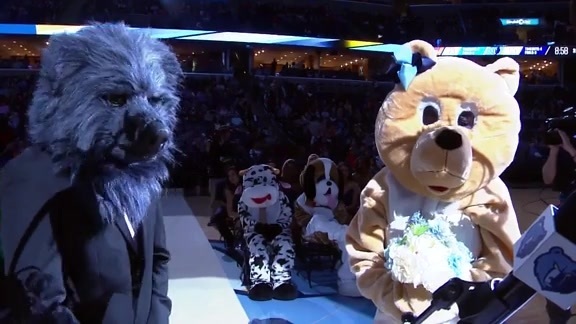 Grizz's wedding didn't go exactly as planned, check out what went wrong at FedExForum. Take another look at Super Grizz's appearance at Wrestling Night. Grizz goes all out for his birthday. The Grizzlies Grannies & Grandpas give Grizz a birthday surprise. Grizz gets birthday gifts from his mascot friends. Grizz's buddies come to FedExForum to celebrate Grizz's Birthday. Super Grizz pumps up Grizz Nation. 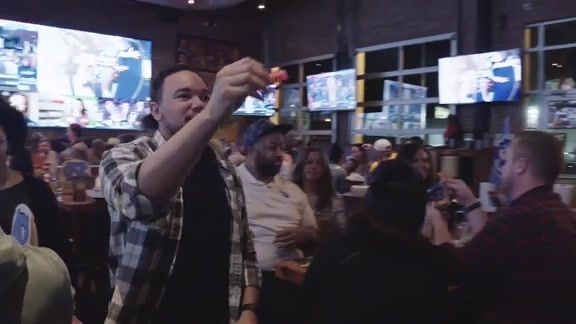 Grizz hosts a taste testing competition between two fans. Grizz recreates Vince Carter's famous "Dunk of Death" in honor Vince's birthday. There's a full moon inside of FedExForum. Grizz shows off his new act inspired by Red Panda. Grizz tricks the popcorn guy and shares the goods with Grizzlies fans at the game. See the first part of Grizz's new magic act. See the second part of Grizz's new magic act. See the grand finale of Grizz's amazing magic act. Grizz welcomes a new member into the family. Grizz tries to save his freind's life. See the high-flying dunks of Super Grizz & the Kings of the Court. Grizz spoofs Red Panda's halftime act. Feeling inspired by Sladek's riveting halftime performance, Grizz tests his balance. Grizz spoofs the K9 Crew performance. Grizz shows off his latest act. Grizz plays an April Fools prank on an unsuspecting Grizz Nation. Super Grizz lays the smackdown on X-Pac. Super Grizz and Jerry the King Lawler pumps up the crowd. Grizz says goodbye to Joey and gives him a present.